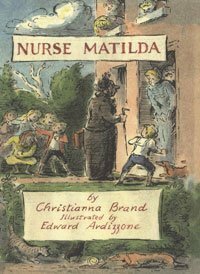 The Brown children are the most ill-behaved, mischievous, naughty little children in all the world, and the only nanny who can possibly control them or teach them any manners is Nurse Matilda. With her magical walking stick, Nurse Matilda teaches important lessons like going to bed when you’re told, not chomping your food, closing doors after yourself, and putting on your best clothes when you’re told. Only the insane magical situations the children find themselves in could possibly teach them to say please and thank you! I started rereading this one as a way to de-stress and help me fall asleep at night, but then I got so interested in the story that I stayed up late reading it! My favorite character is the Baby, whose diapers are always falling down, and who always remembers that “Nurge Magiggy” won’t help you unless you say “please”. A rollicking adventure in the playroom of a grand house with dozens of children constantly getting into disastrous trouble for the most riotous reasons! This book always makes me laugh, and it would be perfect to read aloud to children before bed.